Fantasy fans of Rick Riordan’s Percy Jackson and John Flanagan’s Ranger’s Apprentice series will embrace this first novel in an adventure-filled, Viking-inspired series by a debut author. Meet Karn. He is destined to take over the family farm in Norrøngard. His only problem? He’d rather be playing the board game Thrones and Bones. Enter Thianna. Half human, half frost giantess. She’s too tall to blend in with other humans but too short to be taken seriously as a giant. When family intrigues force Karn and Thianna to flee into the wilderness, they have to keep their sense of humor and their wits about them. But survival can be challenging when you’re being chased by a 1,500-year-old dragon, Helltoppr the undead warrior and his undead minions, an evil uncle, wyverns, and an assortment of trolls and giants. Readers will embark on a sweeping epic fantasy as they join Karn and Thianna on a voyage of discovery.Antics and hair-raising escapades abound in this fantasy adventure as the two forge a friendship and journey to unknown territory. Their plan: to save their families from harm. 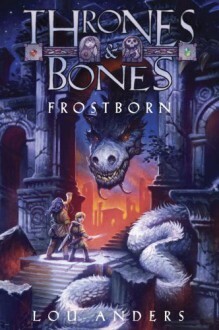 Debut novelist Lou Anders has created a rich world of over twenty-five countries inhabited by Karn, Thianna, and an array of fantastical creatures, as well as the Thrones and Bones board game.